Straddling the border between China and Pakistan, the Karakorum region is home to challenging trekking and jaw-dropping scenery of the world’s second highest mountain range. Heading deep into the Karakorum, our 24-day Ultimate K2 Trek will see you venturing through spectacular mountain wilderness towards the basecamp of K2 (8,611 m)—the second highest peak on Earth. This is no ordinary hike, but a demanding expedition into one of the world’s most rugged and remote regions. Beginning with a breathtaking mountain flight from Islamabad to Skardu, we commence trekking and follow the narrow trails above the Braldu River before ascending the extensive Baltoro Glacier. Accompanied by expert leader, Soren Kruse Ledet, as well as our knowledgeable local guide and passionate crew, we cross the high pass of Gondogoro La (6,000 m) and trek through the imposing landscapes of the Inner Karakorum towards K2 base camp, surrounded by the highest concentration of 8,000-metre peaks on the planet. Tackle an exploratory journey with Tim Macartney-Snape into the depths of the Karakorum and venture beyond the trails to an area which is seldom explored. With Pakistan’s geopolitical background, unpredictable weather and difficult terrain of the region, travel to the Karakorum can pose many challenges. However, our expert crew and unsurpassed safety record, together with your own fitness, flexibility and sense of adventure will ensure that you experience a rewarding and exhilarating expedition. 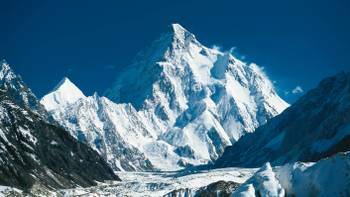 While it may rank second in the world in height, K2 has a reputation that makes it the world's toughest mountain to climb. 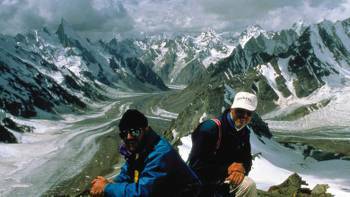 Pakistan's Karakoram mountain range is one of the world's most spectacular. Experience Concordia, which is surrounded by the highest concentration of 8000 metre peaks on the planet. We've been organising treks and tours in Pakistan for many years and our firsthand knowledge of the region is exceptional. Responsible travel practice is at the heart of every program that we offer. When you book one of our adventures you're supporting a program that is committed to safety and sustainability. Enjoy fully supported camping in remote locations with our outstanding crew. While the campsite locations have been handpicked for their location, our commitment to responsible travel ensures our footprint is kept to a minimum. The Karakoram is subject to the south-west monsoon that draws its moisture from the Arabian Sea from mid-June until the end of August. During this time the occasional storm will move north up the Indus valley as far as the Karakoram, although the regularity and intensity of the rains is far less apparent than in the nearby regions of the Indian Himalaya. Localised storms on the higher elevations of the Karakoram are a further important consideration. Records of three or four days of intense bad weather followed by similar fine periods seem to characterise the region and even in September, trekking groups are well advised to prepare for at least one bad spell of weather during the expedition. On the first few days of the trek, extremely hot and dry conditions are not uncommon; temperatures can easily reach 35 Celsius. Adequate sun protection is a must. The main language spoken in Pakistan is Urdu (similar to Hindi), which is taught in schools. English is also widely spoken by business people, officials, guides/staff and in hotels. There are many different tribal languages spoken throughout the country, which are strongly influenced by their geographic location, as well as historic and religious background. Widely regarded as the fiercest warriors and the most handsome of men in early history, the Pathan tribe, located near the border of Pakistan & Afghanistan, with 17 million people is the largest tribal group in the world. They speak Pashto, and can be found in Peshawar, along the Khyber Pass and in much of the northern areas. Balti is most commonly spoken in the Baltistan of which the Baltoro Glacier is part of it. Electricity in Pakistan is 230 Volts, at 50 hertz. The most common pin type is C. (2 round prong). All travellers require a visa for Pakistan. It is the case that a new visa on arrival system for some nationalities is being considered however at the time of writing, we are advised that the existing process remains and should be adhered to. There process for visas and trekking permits for Pakistan can be time consuming and we encourage you to return all the required documents as soon as possible but no later than 4 months prior to departure. This is due to the fact it can take up to 2 months for trekking permits and visa invitation letters to be issued, followed by 6 weeks for visas to be issued (for Australian passport holders and subject to change) once the passport is lodged with the Pakistani consulate. It should be noted your passport will be with the consulate for the duration of the process. A clear copy of the passport data page, a passport sized photograph, the fully completed visa application form and your trekking/climbing CV is required in the first instance for ALL travellers and needs to be sent to World Expeditions without delay. This is then sent to our office in Pakistan who will process your visa invitation letter and your trekking permit, note this will take at least two months. Once the visa invitation letter is issued, it needs to be sent along with your visa application form, a clear copy of your passport data page, two colour photographs, proof of travel arrangements and your actual passport to the consulate along with the appropriate fee. Note these forms are currently applicable for Australian passport holders, please check with your consultant for requirements pertaining to other nationalities. The processing of the visa can take 6 weeks. Note your passport must be valid for six months beyond exit date and have two blank facing visa pages.